Ongoing rehabilitation of Cham-Numan, Gombe-Yola 46.35 kilometres road in Adamawa has generated more than 2,000 direct and indirect employment for Nigerians since the rehabilitation of the road began. The Federal Controller of works in Adamawa, Mr Salihu Abubakar said this on Friday during the inspection of ongoing rehabilitation of highways in Adamawa and Gombe. Abubakar said rehabilitation of the road by the Federal Government a win-win situation for communities linked by the road and commuters moving to other parts of the North-East. He said the road project valued at more than N9 billion had 24 months completion period, adding that the contractor had done 20.14 per cent of the project comprising of 11.2 kilometres vender course. According to Abubakar, government has certified more than N2 billion to date in favour of the contractor noting that the contractor has done almost 30 kilometers of culverts and 400 metres of line drain. “I am happy to say that the project has generated more than 2,000 direct and indirect employments and the contractor is still pushing hard,’’ he said. He said the contractor had promised to complete the project on or before the initial completion period of 24 months. The Project Manager, Mr Lemoya Wam, China Geo Engineering Company (CGC) said the company had completed 11.2 kilometres of the asphalt concrete and other ancillary works. He said the company had already provided an output value of about N2 billion, adding that he was sure CGC would be able to complete the project in good time. Wam said the only challenge was the issue of security for their workers on site and the occasional traffic congestion being experienced while executing the project. Meanwhile, a commuter Mr Richard Charles, in an interview with the News Agency of Nigeria (NAN) thanked the Federal Government for the rehabilitating the road. Charles, however, said that the gesture would be more appreciated by commuters if the government could extend the rehabilitation to other sections of the road in the region. Mrs Joyce Samuel, also a commuter appealed to the Federal Government not to stop the rehabilitation after the elections, given the strategic nature of the road to boost economic activities. Abubakar Mohammed, an indigene of Kano, also a commuter described the rehabilitation as a welcome development, saying that government must monitor the contractors to ensure the project was completed. 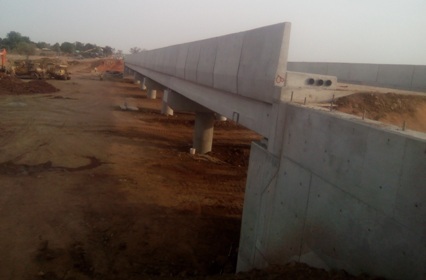 Similarly, the Gombe–Kaltungo,Yola road phase two stretching 68 kilometre, has also provided employment for more than 500 people since the rehabilitation of the road and the construction of a bridge began. This was disclosed by the Project Manager, Mr Imran Khan of Triacta Nigeria Ltd. The Federal Controller of works in Gombe, Mr Salihu Ahmed said the contractor was presently employing labour from the communities around Kumo, Billiri and Kaltungo for execution of works. This, Ahmed said had provided employment and increased the level of commercial activities among members of the communities. He said the project comprising of road rehabilitation and construction of a bridge was awarded on May 23, 2017, to Triacta Nigerian Ltd. at the cost of N8.281billion. According to him, the percentage completion of the road presently is 84.85 per cent, while the percentage completion of the bridge is 81.23 per cent. He said the project, earlier scheduled to be completed in December, might be completed in April given the redoubled effort of the contractor. According to him, the rehabilitation of the road and the construction of a new bridge will ease traffic and reduce the constant accidents being recorded on the road. Abubakar Adamu, one of the workers employed by the contractor also told NAN that the money he was being paid had been the major source of income for his family. He thanked the Federal Government for the road and new bridge construction, saying that the absence of a bridge over the years had resulted in uncontrolled flood in the communities. This, Adamu said had also led to loss of farm lands and other economic activities in the communities. On overall assessment of work done on the projects sites, the Director Highways, North East in the ministry, Mr Mohammed Bufai said the ministry decided to embark on inspection of the roads to ensure that contractors deliver the projects on schedule. He expressed satisfaction with level of work done so far. Bufai said government had made advance payments of the contract sum to the contractors for execution of the projects, hence the impressive results being recorded.